Our guide to St Louis will help you find the best dog friendly places in St Louis Missouri. St. Louis is known as the Gateway to the West. This was certainly the case for Lewis and Clark, who stopped here for provisions during their famous expedition. In the years that followed, the city became a manufacturing center for wagons, guns, blankets, saddles, and everything pioneers would need on their journeys west. But St. Louis is indisputably a baseball town, and a fanatic love of the sport -- and specifically the Cardinals -- is a way of life for many here. Fans also support the NFL's Rams and the NHL's Blues, but rooting for the redbirds trumps everything. There are tons of great dog friendly places in the city of St Louis, our city guide will help you find the best dog friendly places. You may have a hard time deciding what to do in St Louis, but we make your decision easy. 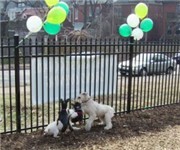 N Taylor Ave & Maryland Ave, (314) 771-3101 - Taylor Dog Park is a dog friendly off-leash dog park located in St Louis MO. There are plenty more dog friendly places in St Louis. See all dog friendly places in St Louis Missouri.